Here’s how it works: He earns money and gives me some. I pay most of the bills and then allocate the rest as I see fit. This is my fabled budget. There are a few bills he handles directly. What he does with the rest of the money he earns, I don’t really know. He has a savings account, but he also uses it to finance big outlays as he sees fit: vacations, home repairs/remodels, etc. I left my job a year ago to be a SAHM. One of the things that held me back from leaving sooner than that was a fear that if I wasn’t earning an income, I would slowly lose my say in money-related decisions. Thankfully, on the whole that has not happened, at least not in the way that I feared. Since my husband, until very recently, worked from home a lot, he witnessed exactly what I was dealing with everyday. He knew I wasn’t eating bon-bons and watching soaps. So it’s clear to him that I work just as hard as he does. And I know I work hard, so I feel totally entitled to anything I can get. I feel even more entitled than I thought I would feel, frankly. But a barrier still exists because he actually holds the purse strings. And although I give my input into these big purchases and products, since I don’t really know his whole financial picture, I tend to go along with what he wants to do. Plus, he owns his own business, so his income fluctuates anyway. I have just been trusting him to not spend too much money. All that is fine; I don’t have time to be his accountant anyway. My problem is that I feel like a sham as far as nonconsumerism goes, because although I try to apply it to the purchases and projects that I am in charge of, I turn a blind eye when it comes to his projects because it’s “his” money, and because he is not a nonconsumer. He likes new stuff and he likes it NOW. A great example is this bedroom remodel we have been working on. It could be a great opportunity for me to apply principles of nonconsumerism, green living, fair trade, everything. But instead I find myself shopping with him at Kirkland’s, buying cheap, poorly constructed furniture just because we want (he wants?) to move back into our bedroom NOW. When I could be scavenging thrift stores, Craig’s List, or my mom’s garage for older, higher-quality pieces and learning how to restore them myself. Repeat this situation at Pier One, Wayfair, and Kohl’s and you get the picture. It’s a push-pull situation. I get that. There are wins and losses. I can’t fight him on everything, and I don’t want to. But I don’t want to feel virtuous in other aspects of my life but then be secretly getting my fix from my sugar daddy. Because after all this time, I still just love to go out and buy new stuff. That urge hasn’t gone away. Although I get a deep satisfaction from finding things I need used, it’s not the same thing. It’s the difference between the high you get from a good workout and the high you get from eating a big bowl of chocolate ice cream with whipped cream and chopped-up Heath bar pieces at midnight on a Saturday when no one else is around. The difference being that the one type of high is followed by crushing shame! LOL. No wonder I am drawn to nonconsumerism. The guilt/virtue dichotomy feels a lot like Catholicism. Anyway. So I will try from now on to acknowledge the purchases I make for my husband’s side of the household affairs, and not treat them as “his” purchases. We are in this together, the money is both of ours, and sooner or later any overspending/clutter/crap will affect us both. By the way, the remodel turned out great. 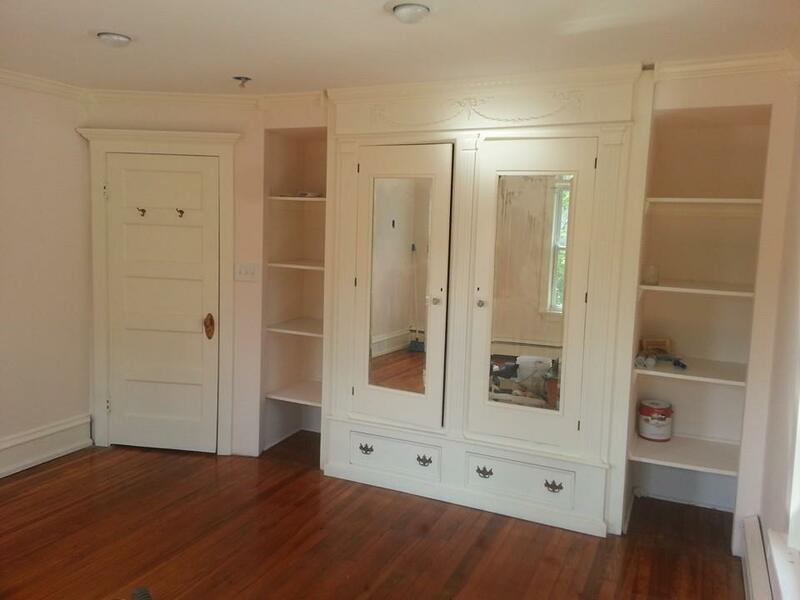 All the work was done by my husband and a friend of his, and my husband did a masterful job recreating some of the original crown molding that could not be salvaged (rotted). Did you offer Tom a rebuttal post?